The border guards of BD “Shegeni” detained three citizens of India attempting to cross illegally the state border at night. The unknown persons were revealed by means of the infrared thermal imager, who were travelling in the outskirts of the village in the direction to the state border. According to the words of the detainees they were the citizens of India. The men had no any identifying documents. So far, the foreigners are detained in administrative order and appropriate protocols are prepared. This entry was posted in Translated Media-News from Ukraine and tagged citizens, india, Ukrainian-Polish border on June 27, 2018 by oksana. Information about three foreigners’ motion toward the border was reported to the officers of the BD “Shegeni” by the local residents. Not wasting time, the law enforcers started to the place of possible stay of the offenders. 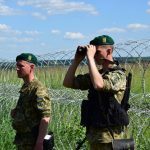 The persons intending to walk beyond the check point aiming to cross the Ukrainian-Polish border were detained. They were the citizens of India, two men and a woman, YOB 1989, 1996 and 1975. The protocols as to the offenders were drawn up under the Part 2 Article 204-1 of Administrative Infringement Code of Ukraine “Illegal cross or attempt to cross illegally the state border of Ukraine”. This entry was posted in Translated Media-News from Ukraine and tagged citizens, foreigner, india, Shegeni, Ukraine, Ukrainian-Polish border on June 26, 2018 by oksana.